Roger Dubuis worked for 14 years with Patek Philippe & Co., where he learned all the key aspects of developing a brand watch. He observed what the market was looking for, and learned how to initiate a brand properly and how to improve upon the new collections and models from the previous designs. The knowledge that he gained from his experience was well spent when he started his own venture, Roger Dubuis luxury watches, with Carlos Dias. The brand of Roger Dubuis was founded in 1980 and since its inception, it has received a lot of appraisal for the work it has done. In 2008, the company changed its owner, with over 60% of its shares acquired by the Richemont Group. Nevertheless, the new shareholders do not plan to curb the Roger Dubuis watch production, and the public is promised to see new models from the brand in the future. The key to success for Roger Dubuis was to develop something completely new and be “rebellious” when it came to developing concepts for the watches. The brand’s designers looked at designs from scratch and used colors and embroideries that have not been used before in watches. However, Roger Dubuis did not forgot his learnings and did not leave the traditional path either. They embraced new designs and mixed them with the traditional approaches, which led Roger Dubuis to develop some really good models. Such a strategy has made them achieve the hallmark of Poinçon de Genève, which is given to only 24,000 units out of 20 million watch units produced in Switzerland. 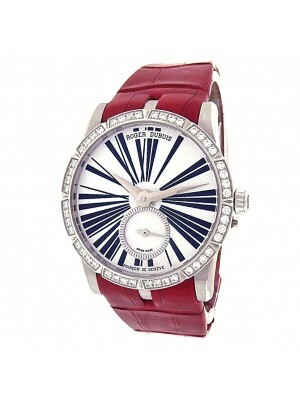 Roger Dubuis luxury watches currently offers only two main collections and that are Excalibur and Velvet. Most of the models in both collections are similar to each other when it comes to functionality. However, they do have some minor differences. Excalibur The Excalibur is more focused towards men. Nevertheless, all of its components are light-weight, unlike conventional watches which are mostly made out of stainless steel. This is achieved because Excalibur is designed with heavy usage of titanium in many of its components. This piece contains an RD380 automatic caliber with a titanium oscillating weight. Another great feature is that it comes with a 48-hour reserve battery. Multiple designs and unchangeably impressive water resistance are available. Velvet Velvet is quite similar to the Excalibur model with respect to mechanism, however, it is specifically designed for females. 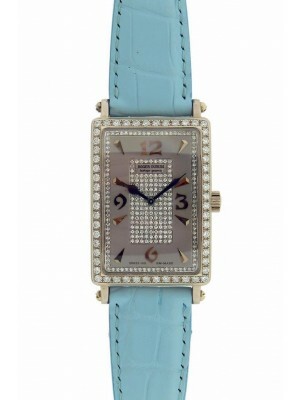 Therefore, much more attention is paid in this watch model to elegance of design and the external appeal of the watch. Its case is made of white gold and it also contains around 110 cut pieces of small diamonds. Just like Excalibur, it is also equipped with 48 hours of reserve in a battery. The design is kept simple to make it look elegant and unique. Both Excalibur and Velvet are marked as Poinçon de Genève, meaning that these watch models are designed in compliance with very strict standards as compared to other collections. 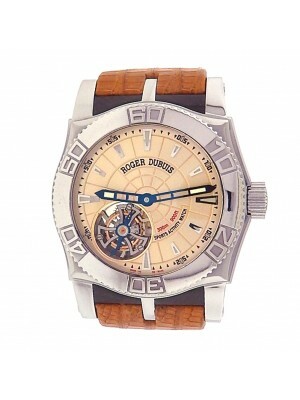 You can buy these Roger Dubuis used watches at Midtown Watch at low rates.